Microsoft’s new Chromium Edge browser is now officially available to test. So, here is the complete tutorial to install it in your Windows 10 computer. After too many rumours and leaks, Microsoft has finally released the preview of Chromium powered Edge browser. Windows 10 users running on 64-bit now have access to two different builds; Dev Channel and Canary Channel. Microsoft Edge Chromium Beta download is still not available. According to the official website, the beta version will bring the most stable browsing experience. You can’t use this browser on Windows 7, Windows 8.1, macOS right now. But, it will be available on other browsers soon. There are three Edge Chromium Download channels. Canary Channel: It updates daily. If you want to watch the daily working process, then this is best for you. Dev Channel: It updates once a week. Dev is more stable than the Canary channel and has been tested by the Microsoft Edge team. Beta Channel: It updates once every six weeks. But, it’s not available right now. Edge is not a bad browser. It’s clean, fast and secure. But, people need more than this. That’s why both of the Microsoft and Chrome engineers have been working together on the Chromium project to give a better user experience to Edge browser. Microsoft has already implemented more than 150 features into Chromium in order to improve the Chromium-based Edge browser on Windows 10. It includes Dark Mode, Smooth Scrolling, Accessibility Improvements, Reading view, Grammar Tools, Translation and much more. Microsoft is planning to replace its Edge browser with a new version based on Google’s Chromium engine. On December 2018, the first time the leak was released on the new browser. On April 8, Microsoft officially realised the Edge Insider Channels. 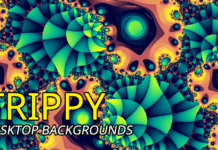 The beta version is still one development and will release soon. There is no confirmation that when the final version will be released. Whenever it’ll release, I’ll update the details here. What is Inside the Edge Chromium? Microsoft edge share many of the same designs found in Google Chrome but the company has been adding its own design changes and features for the product that looks a lot like the old browser but it works just like Chrome. You are going to see many design changes. Microsoft’s currently focusing on essential features, which means that a lot of the features has been disabled or there yet not fully implemented after installing the chromium version of Microsoft edge. If you have been used in the old Microsoft Edge or Google Chrome, the experience will feel really similar which means that there is not a huge learning curve to understand. The browser looks very similar to the traditional version of Microsoft Edge and the way that you open and close tabs open main menu and the new tab experience works just like before. There is even a new profile button that allows you to access and manage settings and switch profiles. 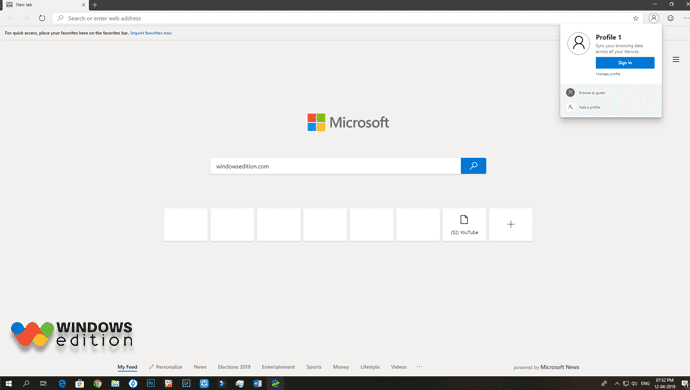 So, yes in the new Microsoft edge you can use different profiles just like Chrome. When you open the browser settings that’s when things start looking a little different in this new version. The settings experience is similar to the chrome experience instead of a flyout pane. The settings are now laid out in a full-sized page with the left navigation pane. There is a search box at the top that allows you to quickly find and manage many of the settings on this new version of Microsoft edge. Microsoft is going to extend its functionality to other content such as extension history and open tabs in addition. You can control your passwords, payment information, addresses for autofill and you also have an option to import data from another browser. You can download the new Edge chromium browser and install it in your Windows 10 computer within a few seconds. Keep in your mind that, it’s just a preview. So, you can except so many bugs. Dev Channel is better than the Canary Channel. Whenever the Microsoft Edge Chromium Beta is available, I’ll update it here. Well, without delay, let’s start the process. 1. First of all, jump over the official website. 2. Here, select the Download button below the Dev Channel. 3. A tiny file will be downloaded. Open the file to start the online installation process. It’ll take a few seconds or minutes according to the speed of your Internet connection. Once it is installed, open it to start browsing. That’s it. This is the procedure for Microsoft Edge Chromium download and installation. Chromium powered Edge is the future of the old Edge browser. You’ll get all the benefits of the Chrome browser out of the box. If you liked the guide, then don’t forget to share with your friends. 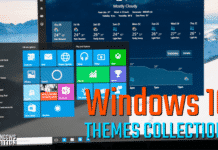 Best Windows 10 Themes You Should Download Now!